England crashed out of the Champions Trophy at the semi-final stage as they were thoroughly outplayed by Australia. Batting first on a good wicket, England collapsed to 101-6 before Tim Bresnan (80) and Luke Wright (48) put on 107 to help them to 257 all out at Centurion. Ricky Ponting and Shane Watson both hit centuries in a national record stand of 252 as Australia cruised home with nine wickets and 49 balls remaining. 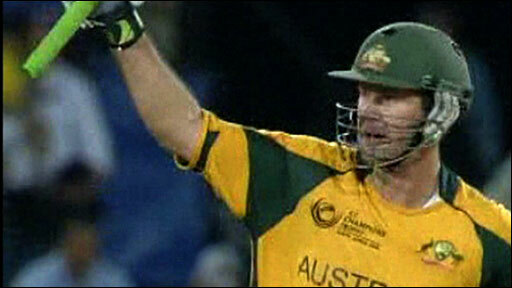 Watson hit seven sixes in his 136 not out while Ponting made an unbeaten 111. It was the best ODI partnership by any Australia pairing and by the end of it England looked just as innocuous as the team thrashed 6-1 in the September one-day series between these two sides. Australia progress to Monday's final against either Pakistan or New Zealand, and on this sort of form the defending champions will take some beating, while England take the rest of the month off before returning to South Africa for an 11-week tour. While Australia were able to name the same side who had taken them through the group stage unbeaten, England's build-up had been troubled by the continued illness to Matt Prior and Stuart Broad's torn buttock muscle. Having coped with the Prior setback by handing the gloves to Eoin Morgan and putting Ravi Bopara in the team for two games, the management decided they required a specialist wicketkeeper. So Steve Davies, who is moving from Worcestershire to start next season with Surrey, was shoe-horned into the middle order. Broad, England's leading wicket-taker in the tournament with 10 victims in the three round-robin matches, was not fit so Bresnan was handed a first appearance in South Africa, while there was also a third change from the side comfortably beaten by New Zealand on Tuesday, with Graham Onions in for a sick Ryan Sidebottom. The wickets at Centurion have generally provided opportunities for big scores by the sides batting first, and this, a brand new strip with just one or two cracks, played beautifully for the batsmen. It was disappointing, then, that England, having rescued one crisis by going from 16-2 to 71-2, caved in miserably as four more wickets fell for the addition of 30 runs. After the first two blows - skipper Andrew Strauss lazily flicking to square-leg where he was brilliantly caught by James Hopes and Owais Shah getting too thin an edge on his leg-glance to be snapped up by wicketkeeper Tim Paine - Paul Collingwood and Joe Denly launched a spirited counter-attack. Collingwood was the aggressor, driving on both sides of the wicket, pulling and cutting as he gave Hopes and Mitchell Johnson a torrid time - and the pair put on 55 off 53 balls. But there was one pull shot too many from Collingwood, who top-edged to Paine, and then came a real clatter of wickets. Denly reached for one without moving his feet, and Paine took a third catch with a fine, diving effort. Next, Davies's inside edge off a defensive prod resulted in a harmless-looking ball being diverted straight into the stumps - and worse was to follow when Morgan made a scratchy nine before trying to cut a ball that was too close to him and giving Paine a fourth catch. Australia's seamers had caused total havoc as Wright and Bresnan began their counter-offensive, and the only good thing was that England still had almost 30 overs of batting at their disposal. Wright and Bresnan, showing impressive maturity, spent the initial part of their stand just ticking the scoreboard along with ones and twos. 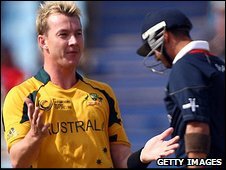 It was only from the 35th over that they seized the initiative, Wright slog-sweeping Nathan Hauritz for two sixes, one of which was declared the biggest of the tournament at 103m. Both batsmen looked impressive and it was a flagging Australia who finally stopped the pair setting a new record for England seventh-wicket stands when Wright's outside edge off Peter Siddle gave the bowler his third wicket - and Paine his fifth catch. With exactly 10 overs remaining, and just three wickets in hand, the batting remained frenetic. Swann and Bresnan had luck on their side adding 37 in five overs before Swann took on Hauritz's arm for a second run and was run out. 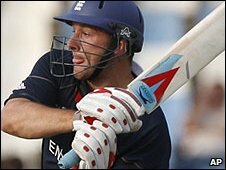 Bresnan, just one hit away from breaking Kenyan Thomas Odoyo's record score by a number eight in ODIs, was bowled by Lee and the last wicket to fall was also as a result of a run-out, England failing to last out the 48th over. Flying ants prevented Australia making a prompt start with the bat under the Centurion floodlights, and they suffered a setback in the second over as Paine nicked Onions behind. Onions and James Anderson began tightly, putting Ponting and Watson under a bit of pressure as Australia moved gingerly to 18-1 with one ball left of the fifth over. But what should have been a dot ball to end the over resulted in a bonus four for Ponting as Morgan's return to Davies from short extra-cover soared over the keeper's outstretched arm and to the boundary. From that moment, everything went wrong for England, and Ponting in particular took full toll, carving three boundaries from Anderson's following over and two more when Bresnan came on. A dull passage ensued as Watson and Ponting collected singles, and Australia moved past 100 in the 21st over, but at that point a wicket should have come. Watson, feeling the time was right for a big shot, launched Swann to long-on - where Wright had to position himself perfectly to take the catch with the rope just behind him. He failed to do so, parrying the ball over the rope in the process, and England's last real sniff of an opening had evaporated. As the target continued to be reined in, Ponting looked thoroughly secure and when the 34-year-old pulled Onions for four he became only the third player after Sachin Tendulkar and Sanath Jayasuriya to reach 12,000 ODI runs. That, plus Watson's second six off Swann, left just 107 needed from the last 20 overs. A crisp cover-drive for four by Ponting off Bresnan brought him his 28th ODI century, while Watson got to his third in more spectacular style, pulling Anderson for six. He hit three more maximums from four balls off Collingwood as Australia eased to an emphatic victory.